The PRS 2018 SE Chris Robertson Signature Electric Guitar in Black Stone Cherry Burst is the outstanding go-to guitar for the Black Stone Cherry frontman. As no stranger to the road, Robertson needs a guitar that can not only fulfil his tonal demands, but can also endure anything thrown its way during a hectic tour schedule. The PRS 2018 SE Chris Robertson doesn't just meet expectations, but far exceeds them. The body is shaped to a heavenly single-cutaway profile, with a deep rout on the cutaway for improved access to the highest frets. The bevelled edges combine with the slim body depth to maximise playing comfort with a familiar figure-hugging feel. The back is crafted using mahogany, a solid tonewood that is highly regarded thanks to its impressive mid-range energy infused with a hearty warmth. Paired with the top is a bright and crisp-sounding maple, which lifts the upper-mids and highs to deliver a well-rounded output. The beautiful flame-maple veneer adds an elegant touch, whilst the unique black stone cherry burst paint work enhances the visual aesthetic. Fitted to the body is a divine mahogany neck, which is shaped to a wide-fat profile along a generous 24.5-inch scale length. The neck feels wonderful and plays like a dream, making it effortless to fret chords, sail through scales, and lay down lightning-fast licks. The hardwood fingerboard guarantees offers 22 frets that are decorated with PRS' unique bird position inlays. Working in harmony with the neck, the fingerboard offers a luxurious experience for your fingers to savour. 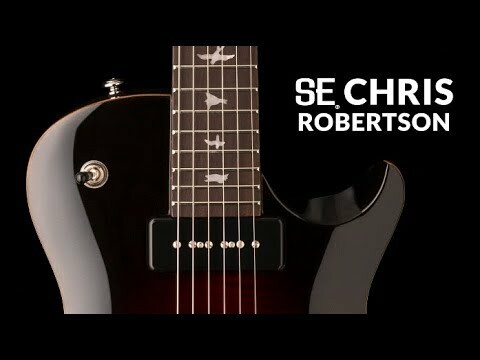 The PRS 2018 SE Chris Robertson Signature model is equipped with Robertson's unique setup that comprises a 57/08 "S" humbucker in the bridge, and an SE Soapbar single-coil in the neck position. Showcasing his love of a humbucker/soapbar pairing, Robertson's model produces an enviable tonal arsenal for you to play with. Control comes in the form of a three-way pickup selector switch, independent volume controls for each pickup, and independent tone controls. The bridge pickup tone pot is equipped with a push/pull control, which allows the coils to be split, pulling a much grittier output from the humbucker. The PRS 2018 SE Chris Robertson Signature is equipped with a PRS adjustable stoptail bridge, which anchors each string to uphold intonation and sustain dutifully. The headstock is home to PRS-designed tuning machines, which make sure that no matter how enthusiastically you perform, you can rest assured that your strings will be good to go.